California sycamore truly shines in the winter. While many deciduous trees lose their beauty and charm in these months, this tree becomes a sculptural masterpiece of nature – with bark that glows in the sun. As a native riparian tree, it is found all along our creeks – and was one of the few trees that had been growing in our area long before the arrival of humans. If fact, California sycamore was so prominent in our Central Coast that pioneer settlers used them as landmarks. One tree, which stood on the south end of Milpas Street reportedly was used as a light house – guiding offshore sailing ships when lanterns were hung in its upper branches! They are fast growing trees, specimens of which can reach over 100 feet in height in creekside locations. However, as human-planted landscape trees, they usually only rise to 40 to 60 feet. Under optimum growing conditions, they can live for over 200 years and may develop trunks exceeding 10 feet in diameter! There are several features of the California sycamore that distinguish it from non-native sycamores and make it a standout in our landscape. Perhaps its most picturesque features are its often-unsymmetrical growth habit and strongly sculptural form. Its trunk frequently leans dramatically, its crown is wide-spreading, and its limbs are massive. It commonly has multiple trunks which have unusual twists and turns. 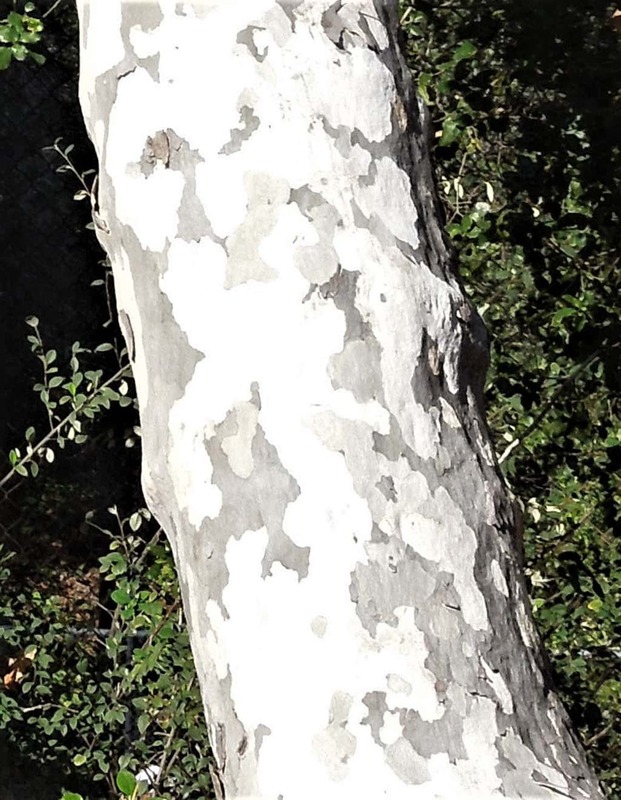 Its attractive mottled bark bears large patches of creamy white, light beige, and gray; older bark may fall off in irregular pieces, adding to the patchwork appearance. Large deeply-lobed leaves may be up to 10 inches long and equally wide and have three or five pointed lobes. New leaves are a bright green with woolly hairs on both sides. Older leaves become dark green on top with hairy undersides – these drop in the fall. Inconspicuous flowers occur in spring, along with the new leaves. Female flowers develop into 1-inch round fruit with 3 to 5 seed balls per stem. Many small birds feed eagerly on the fruits and seeds. 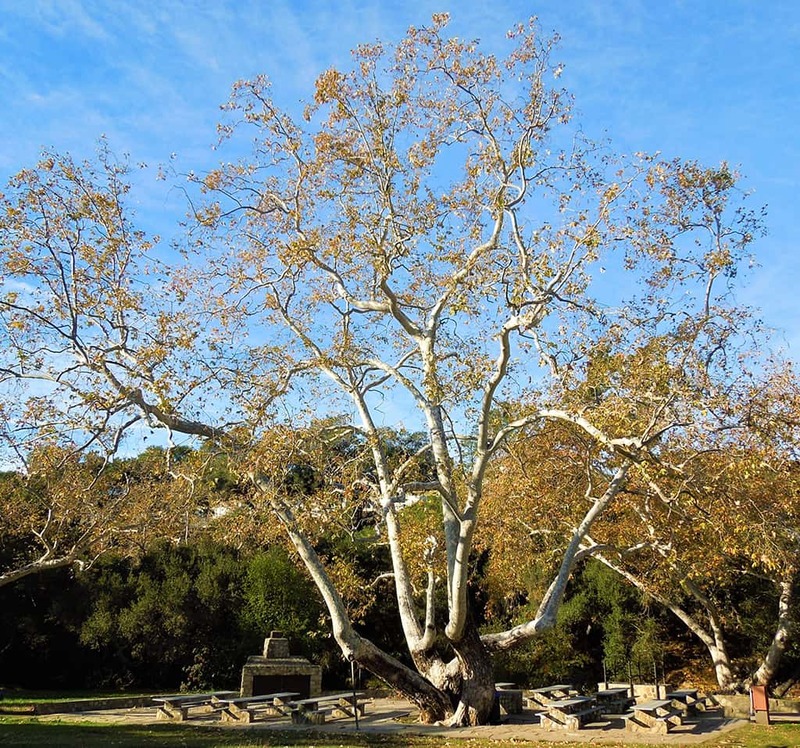 California sycamore is also known by other common names, including “Western sycamore” and “California plane tree” in English, as well as “Alisos” in local Spanish. The botanical name is Platanus racemosa; the genus, Platanus, comes from the Greek “platanos”, meaning sycamore – and the specific epithet, racemosa, is a reference to the flowers that occur on racemes (short-stemmed clusters). California sycamore grows best in full sun to light shade. It tolerates most of our local soils, but prefers soils along the creeks. When well established, it is surprisingly drought tolerant; however, during droughts or where natural water is not available, it does benefit from additional deep irrigation. Considerations for planting locations include its pollen and hairy fuzz on the leaves (these can be allergens for some people) and leaf drop. Leaf drop frequently results from a disease called anthracnose (caused by a fungus) which causes leaves to discolor and drop early, but rarely does permanent damage to the tree. This stately native tree is found wild in our creeks and canyons and has been planted all around Santa Barbara. Large specimens are found in Oak Park, in Stevens Park, at the Santa Barbara Botanic Garden, at the Santa Barbara Museum of Natural History, and in the grounds around the Mission.